Sexual abuse blindsides victims in its wake. Against the backdrop of that torment, Jesus, a fellow sufferer, speaks into our anguish and paves the road toward a life beyond desolate. A new book by Tammy Schultz and Hannah Estabrook, Beyond Desolate: Hope Versus Hate in the Rubble of Sexual Abuse, proclaims hope into a world not absent of ache, but a world where He bleeds with us and brings us a new song. Beyond Desolate uses the biblical story of Tamar, who was raped by her broth- er, as the starting point for a penetrat- ing and insightful look at the elements of recovery and re-institution of hope. Schultz and Estabrook are themselves both victims of sexual abuse and work in the therapeutic community. Schultz is a professor, speaker, and counselor and was awarded the 2010 Indiana Counselor of the Year by the Indiana Counseling Association. Estabrook holds the master’s degree in counsel- ing and is the co-founder of AVAH! Ministries, which provides womens’ seminars on body image, sexuality, friendship, and other topics. Beyond Desolate is a 342-page paperback which full of biblical, quality resources for victims, counselors, friends, and family. Each chapter contains “Discussion Starter” questions for use by therapists, in support groups, or for individual reflection. A “How to Use This Book” section gives 14 specific suggestions on how to utilize the book and to extend its ministry to help the hurting. 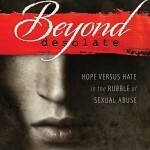 Beyond Desolate is available online, in bookstores, or at bmhbooks.com. The retail price is $16.99 and the ISBN number is 978-0-88469-279-9.